Corporate video is dead...long live video! The future is video but not as we know it, says Tim Hore. Charity Learning Consortium CEO Martin Baker talks serendipity and success in L&D. Lucy Speed looks at the importance of learning and development plans in tackling internal skills gaps. Behavioural economics: What's it got to do with L&D? Mark Gilroy links behavioural economics to learning. Julian Roche makes the case for financial training regulation. When it comes to L&D, Jonny Anderson welcomes the rise of the machine (learning). Chris Pendrey looks at how employers can train a health and safety apprentice to improve workplace productivity and boost staff morale. Charles Hipps concludes his feature about technology and the talent acquisition process. Jason O' Brien says leaving the tech alone could be the key to productivity. Pitting people against technology is not the answer to future recruitment and retention. Training is. Echoing our blog post earlier this week, Helen Jamieson points to training and upskilling as the way to combat automation. The team at TJ have considered all the nominations for the TJ Special Achievement Award this year. We're not into the whole brevity thing this week. Productivity: Is it about working hours or is it about performance? Dr Cath Bishop says you need to figure out your goals before working out how to be more productive. 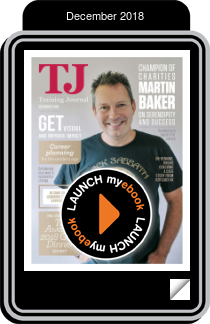 James Barrass-Banks shows TJ one of the reasons that L&D has marketing jealous and how you can maximise that advantage. Jon and Kate tackle presenteeism and the non-stop expansion of Closer Still Media, then Jo joins to discuss the month's webinar and magazine.